USB Charging Cable. Tablet in Pristine condition. The item doesn't include original box. Tested on 21 Point Check System by trained professionals. You would need to Hard Reset the Device to make sure all the Data is erased. Sim Card: The Sim card is not included with the sale, you would need to use your existing SIM Card or order one from your carrier. Blackberry Playbook 16GB WiFi. Original owner. The BlackBerry PlayBook has 1 GB RAM to enhance the processing speed. With Wi-Fi connectivity, this BlackBerry tablet lets you surf the internet even when you’re traveling. •Model: RDJ21WW. •Display Size: 7in. 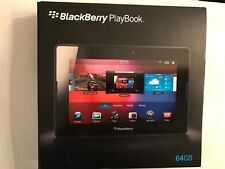 •BlackBerry 64GB Playbook Tablet. •Storage: 64GB. This ultra-portable tablet looks. •Native Resolution: 1024x600. •Screen Protector (Already Applied To Tablet). •Safety and Product Information Booklet. Model: RDJ21WW. Processor1 GHz ARM dual-core CORTEX A9 OMAP 4. Summary : Screen Size, Screen Resolution, Graphics Coprocessor, Graphics Card RAM. Other Technical Details. No exceptions! Battery Typelithium_ion. BlackBerry PlayBook. Full Touch Screen. Works great and in great condition! Case, rapid travel charger, and rapid cradle charger included with tablet. Thanks for looking! Contact me if you have questions. 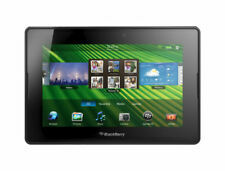 You are purchasing BlackBerry PlayBook 32GB, Wi-Fi 4G (Unlocked), 7in - Black. Playbook Works/Power's On and is Factory Re-set. Blackberry playbook 64GB, in original box, excellent condition, with power cord and USB cable. Working great. This is a like new tablet. Works perfectly and was kept in a smoke free home. Tablet comes with original box, cables and soft sleeve case. BlackBerry PlayBook 16GB, Wi-Fi, 7in - Black With Case - Complete. Condition is Used-like new. Shipped with USPS Priority Mail. The BlackBerry PlayBook supports up to 1080p video playback. The BlackBerry PlayBook supports high resolution video playback (H.264, MPEG4, WMV), and audio (MP3, AAC 5.1, WMA 5.1 audio playback) formats. BlackBerry PlayBook 64GB, Wi-Fi, 7in - Black. This playbook is used and is in fair condition. It has been cleared and tested and is fully operational and functions as intended. Because it is used, the screen contains scratches. The BlackBerry PlayBook has 1 GB RAM to enhance the processing speed. With Wi-Fi connectivity, this BlackBerry tablet lets you surf the internet even when you’re traveling. Its been used very little. 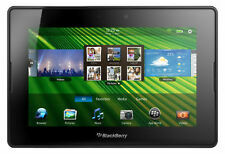 Blackberry Playbook P100-16WF. # 3G network access using your BlackBerry® smartphone as a modem; 4G network access available on BlackBerry® 4G PlayBook™ tablet. RDj21WW 16GB. # Available in 16GB capacities. Here we have a BlackBerry Playbook 16GB tablet. It's a sophisticated approach to multitasking--giving you more choice around how your applications run, allowing you to tailor the experience to your individual needs. BlackBerry PlayBook 16GB, Wi-Fi, 7in - Black. Condition is Used. Shipped with USPS Priority Mail. 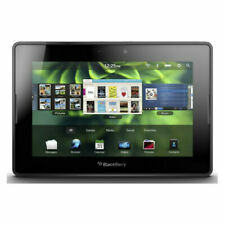 BlackBerry PlayBook 32GB, Wi-Fi Bluetooth, 7in - Black. Shipped with USPS Priority Mail. Just be patient and step through it. 2) let Windows install the device driver -- (it may fail during this step if the PB shuts down -- if it does, disconnect the PB and ensure Windows is NOT set to download drivers from Windows Update, as the BB software will already have what it needs on your machine. BlackBerry PlayBook 16GB, Wi-Fi, 7 inch - Black. Condition is Used. Shipped with USPS Priority Mail. For Sale :BlackBerry PlayBook 32GB Black Tablet PC - Convertible Case/Stand - Fully Works. Included Accessories: Device and battery and BlackBerry case/stand. Playbook in great condition, 16gb. recently re installed OS. This is a capacitive LCD touch screen with multitouch capabilities and a light sensor. Another exciting aspect of the BlackBerry PlayBook is an HDMI output that lets you mirror your screen to a monitor or TV.Under the hood is a dual-core ARM Cortex-A9 that operates at 1000 MHz. BlackBerry Tablet OS. Native Resolution. BlackBerry PlayBook. TFT active matrix. Item is pre-owned and is in great condition. Product Line. Keyboard, Touch-screen. OS PROVIDED. Works great. picture are the condition of the tablet. get just used tablet. reset to factory setting and reed to go. Whats in the pictures you get. OS Version: 2.1.0.1917. Final Sale. BlackBerry - PlayBook Tablet with 16GB Memory use. I sale it for parts because just few days ago stop working. The screen stay black and do not give no sign like is charging. Blackberry Playbook 64 Gig. Bundle Nice condition. Blackberry Playbook 64 Gig. Bundle Nice condition. Not android. Runs on Blackberry software. Condition is used, very good condition. I do record serial numbers for yours and my protection. Works very well. 4.5 out of 5 stars - Blackberry Playbook 64 Gig. Bundle Nice condition. 155 product ratings155 product ratings - Blackberry Playbook 64 Gig. Bundle Nice condition. Part# RDJ21WW. 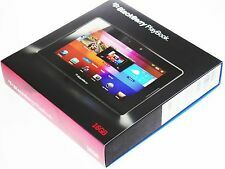 BlackBerry Playbook Black with Clear OEM case sealed in box with accessories. BlackBerry PlayBook 32GB 7" Multi-Touch Tablet PC with 1 GHz Dual-Core Process..
With our dynamic pricing model, our prices are always competitive. You're already purchasing the item. 4.5 out of 5 stars - BlackBerry PlayBook 32GB 7" Multi-Touch Tablet PC with 1 GHz Dual-Core Process..
184 product ratings184 product ratings - BlackBerry PlayBook 32GB 7" Multi-Touch Tablet PC with 1 GHz Dual-Core Process..
BlackBerry PlayBook 32GB, Wi-Fi, 7in - Black. But there will be rare occasions when my best efforts are not enough and the item you have received has problems. I will do my best to answer promptly.